Looking for deals in Ghent? Boutique hotel 1898 The Post offers accommodations in an iconic, historical building in the heart of Ghent. It is located in the former post office. Comfortable, cozy and a great staff! Perfect location in he heart of old town! The beds were also comfortable which is very unusual! Air conditioning in the rooms too! The elegant Ghent Marriott combines historic charm with modern design. Great all around, in every respect. Highly recommend. This luxurious family-run hotel in the Patershol District of Ghent has rooms in 2 historic buildings and a free heated swimming pool. Neat place to stay for a vacation. Quite and spacious. Hotel Carlton is 215 yards from Ghent Saint Peter's Train Station and an 8-minute walk from the ICC Convention Centre. Very friendly staff and nice comfortable room (deluxe room). Located on a quiet street in the heart of Ghent, Ganda Rooms & Suites is housed in a 18th century style townhouse with a patio and terraces. Free WiFi access is available. Korenmarkt is 2297 feet... location, breakfast, friendliness. Novotel offers air-conditioned rooms with flat-screen TV in Gent city center, only 1148 feet from St Bavo’s Cathedral. Excellent location to explore the beautiful city of Ghent. Holiday Inn Express offers spacious rooms with free breakfast and WiFi near the E17 motorway. It is 2.5 mi from the medieval city center of Ghent. Public parking is available for a charge. Had a great stay, very convenient to visit Brugge, Antwerp, Brussels and Ghent. 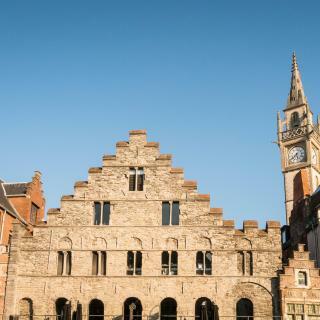 The NH Gent Belfort is located next to Ghent’s historic town hall building. It features stylish accommodations, a fine dining restaurant and an on-site gym and sauna. Free WiFi is available. Extremely central location and the staff were great. Cour St Georges offers rooms in an 18th-century building in Gent’s historic center, within a 3-minute walk from the Saint Bavo's Cathedral, the Belfry and Saint Nicholas' Church. Owner/operators were very kind. Breakfast was great! 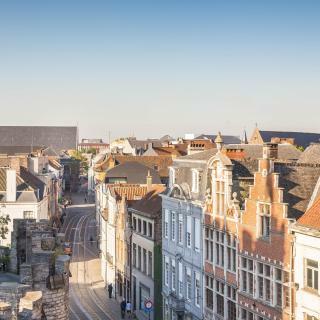 The ibis Gent Centrum Opera is in historic Ghent, a 2-minute walk from the Flemish Opera House and a 10-minute walk from Saint Bavo's Cathedral, the Belfry of Ghent and Korenmarkt Square. Location, staff, room, comfort. Holiday Inn Gent Expo offers a convenient location next to Flanders Expo and Ikea Ghent, providing a restaurant and a bar, a fitness center and free wired and wireless internet throughout the hotel. The Good: This was a nice clean hotel. Hotel Cathedral offers spacious rooms in Ghent’s historical center within 656 feet from Saint Bavo's Cathedral and the famous 3 towers of Ghent. Staff was extremely friendly and helpful. Let us borrower power cord adapters. Located directly opposite Saint Bavo's Cathedral in the center of Ghent, this hotel offers modern rooms with a flat-screen TV. Excellent value for money especially if booked with the discounted fee on Booking.com. 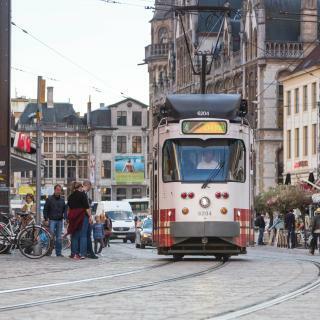 In a residential area in Ghent, this hotel has a convenient location a 2-minute walk from Saint Peter's Train Station and a 15-minute walk from the historic center. It is conveniently located in the city centre. Clean room, great bathroom! 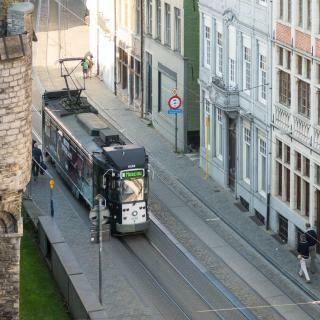 Hotel Gravensteen is located in the heart of Ghent's old town, just a few steps from the Castle of the Counts. Good breakfast, food available untill the last minute of breakfast. Parkhotel is a fully renovated and modern hotel at walking distance from the historic city center. The owner and staff were very friendly and welcoming. The Flandria Hotel is a simple guest house that offers budget accommodations in the historical heart of Ghent. Benefit from the short distance to the main sights and attractions. It was very nice experience in all aspects. Right in Ghent's historic center of the city, Hotel de Flandre is in a historic 18th-century townhouse and features a terrace and an on-site cocktail lounge and bar. Just a wonderful experience, everyone was so friendly, hotel is beautiful & location perfect! Hotel Lepelbed offers air-conditioned rooms with free WiFi, just over 10 minutes’ drive from Ghent. Its restaurant opens onto a furnished terrace, which overlooks the landscaped garden. Room was very beautiful and romantic ♥ 😊!!! Thank you so much for everything! This family hotel is located a 5-minute walk from the train station. There is a pretty garden with terrace. Hotel Astoria Gent’s rooms are warmly decorated and feature digital TV. The room was excellent. good comfy bed. Minibar. Very nice staff that went the extra mile. This hotel blends an industrial history with elegant décor and modern facilities. Ghent River occupies several former factory buildings, less than half a mile from the Botermarkt. Totally surprised at the scale (largeness) of Ghent, a miracle of a city. Right across from Gent-Sint-Pieters railway station, the family-run Hotel Castel offers a beer house, sauna facilities and good transport connections into the city center. The scrambled eggs weren’t good, but the omelettes were, when they made them! Which hotels are the best ones to stay at in Ghent? 1898 The Post, Hotel Carlton, and Hotel Harmony are some of the popular hotels in Ghent. Which hotels in Ghent are good for couples? These hotels in Ghent are highly rated by couples: Ganda Rooms & Suites, 1898 The Post, and Hotel Carlton. What are the best hotels in Ghent near Friday Market? Some of the best hotels in Ghent near Friday Market include B&B De Waterzooi, B&B Great and B&B Botermarkt 6. 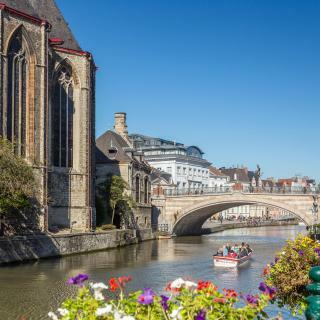 Which hotels in Ghent are good for families? Many families visiting Ghent loved staying at 1898 The Post, Hotel Harmony, and Ganda Rooms & Suites. Which hotels in Ghent have nice views? 1898 The Post, Guesthouse PoortAckere, and Hotel Harmony got great room view-related reviews from travelers in Ghent. How much is a hotel in Ghent for this weekend? The average price per night for a 3-star hotel in Ghent this weekend is $240 or, for a 4-star hotel, $349. Looking for something even fancier? 5-star hotels in Ghent for this weekend cost around $351 per night, on average (based on Booking.com prices). Which neighborhood is the best one to stay at in Ghent? Gentbrugge, Ledeberg, and Mariakerke are popular with other travelers visiting Ghent. How much is a hotel in Ghent for tonight? On average, it costs $111 per night to book a 3-star hotel in Ghent for tonight. You'll pay around $151 if you choose to stay in a 4-star hotel tonight, while a 5-star hotel in Ghent will cost around $164, on average (based on Booking.com prices). Which hotels in Ghent offer an especially good breakfast? For hotels in Ghent that serve highly-rated breakfasts, try Ganda Rooms & Suites, Hotel Carlton, and Hotel Harmony. How much does it cost to stay in a hotel in Ghent? On average, 3-star hotels in Ghent cost $129 per night, and 4-star hotels in Ghent are $157 per night. If you're looking for something really special, a 5-star hotel in Ghent can be found for $237 per night, on average (based on Booking.com prices). Located in the Flemish region of Belgium, the beautiful medieval city of Ghent is a city of history and romance. It's full of hidden historical, cultural and culinary gems that you can easily discover. The Gravensteen or "Castle of the Count" is a deceptively enchanting sight dating back to the Middle Ages. Constructed by Philip of Alsace, the count of Flanders, it's partially surrounded by a moat and beautifully restored, and hosts an interesting museum about the history of prison life. Part of the UNESCO World Heritage list, the Belfry of Ghent is a medieval tower overlooking the Old Town centre. Saint Bavo Cathedral and Saint Nicholas' Church are the city's other two towers, with St. Nicholas' Church being one of the oldest landmarks in Ghent. 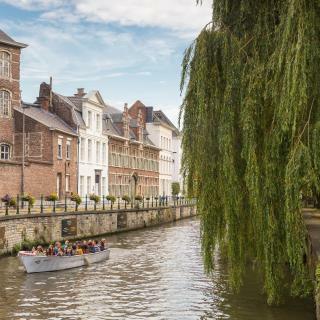 Enjoy a relaxing walk in the picturesque medieval streets and stop at one of the charming traditional restaurants for Belgium beer and a classic Flemish meat stew with French fries. 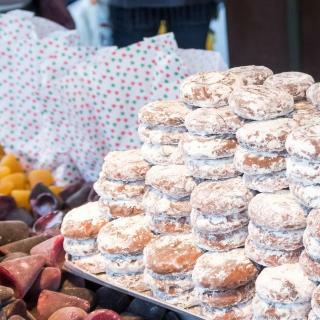 Local delicacies include the popular Belgium chocolate and the purple jelly-filled candies called the "noses". Antwerp International Airport is 32 miles away, while Brussels Airport is 34 miles. Just book your hotel, guest house, apartment, or B&B through Booking.com and discover everything this stunning city has to offer. We traveled to Ghent and Bruges. We traveled to Ghent and Bruges. Bruges was the city I was looking forward to the most, but it should have been the other was around! Ghent was fantastic! This was my favorite city in the seven countries we visited! Fabulous place to visit, every street in the centre has wonderful building and sights. Food amazing and market great fun. Don't forget to try the waffles, and to visit less obvious places like Graffiti street. The castle tour was well done as was the canal boat ride. The castle tour was well done as was the canal boat ride. The city center with it's rich history and wonderful old churches was very much fun.. Food and shopping were abundant and the people were very friendly. Beautiful medieval city. I got impressed about the rich heritage of this place. Ghent is less touristic than other belgian cities, which gives a better experience for someone that look for a quiet stay. Gent has well preserved medieval architecture, with modern shops, great cafés and world class restaurants. You can also be out of the city and biking in the countryside within minutes. If museums are your thing, there’s plenty of that too. All in all, a perfect city getaway. Gent is a little Gem, right in-between Brugges & Brussels, if you don't want the city life nor the touristy scene, but still very beautiful and historical - quaint. However we went ring shopping and DO NOT BUY AN ENGAGEMENT RING THERE THEY WILL ROB YOU! Great spacious apartment, nice and clean. The hosts are hands on and Available to assist with any questions or problems we had. Location is good, about 5 mins walk to tram lines that can take you anywhere. Grocery store 5 mins. 15 mins easy walk into the city centre. 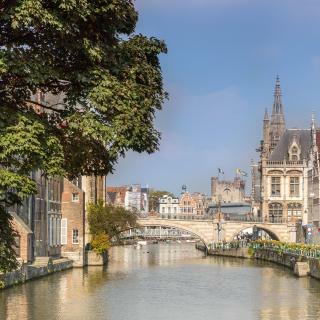 A great option for exploring Belgium, and is the perfect city to stay in with day trips to Brussels, Bruges, Antwerp etc, don’t forget to leave a day for Ghent also ! Wonderful! Our favorite hotel of six weeks in Europe. It felt like we were on a cruise ship. Hotel staff, especially Frankie were exceptional, friendly and helpful. Super location right on the river and close to all of Ghent. Room was top Marriott quality, large window, comfortable bed, great bathroom and quiet, all what we look for in a stay.. Lobby of hotel is very unique. Staffs were very polite, very energetic, and very helpful. Hotel looks new, clean, and stylish. Interior decoration of the lobby and the room was great. Spacious room! Lots of outlet. Nice decoration. Kettle in the room! Less than 5 minutes away from Ghent train station. Getting to city center is easy. By the sound of the other reviews I think we received one of their newly refurbished rooms. The room was very modern, updated and clean. It came with a coffee machine and little fridge as well. We loved the breakfast as well and having tea throughout the day. The hotel was very beautiful and historic! The apartment was clean and comfortable. We were given excellent advice on where to go and what to see. That included a delicious local’s restaurant away from the tourist area and a local’s bar to watch Belgium play France in the 2018 WC semi-final. The hotel is right on the border of Ghent's pedestrian zone, and 2 mins walk from the cathedral. You can check in until 11:30PM, and there is a small parking by the corner (3h max parking time, free overnight and on Sunday). Very good breakfast. Very clean, confortable, smells good and nice. Good location (~15 min walk from main square, ~10 min walk from a train station where you can go to other Belgium cities). Not expensive, superb cost-benefit ratio. The host was very helpful and kind. There were the cleanest sheets during our trip to Belgium. Hostel was nice, about 10 minuets from the main square. Very hospitable guy at the reception. Breakfast is included. If you come from the train station, it’s better to take tram. Excellent Hotel, the staff at the hotel and the Irish bar attached were fantastic. I would definatley recomend this place. Ghent was a beautiful place to visit and all in all an excellent few days with my wife and daughter. The shower was the best. Great location as we like to be out of the centre, 5 minute drive into Ghent.Nice and friendly small hotel, delicious breakfast buffet. This is a new hotel with underground parking. It’s located outside of the old town (20 min walk or short bus ride). Great hotel in very central location at a reasonable price. We hope to be back! nice, clean hotel. very close to tram to old town. parking with no issues. Europa Hotel is a lovely hotel, a little bit away from downtown, but you can walk or ride a bike to get there (they rent them too). Rooms are cosy, bed is a heavenly gift!! And staff is warm and helpful. Totally surprised at the scale (largeness) of Ghent, a miracle of a city.